When architects and engineers look for the best in structural lumber, their first choice repeatedly is Douglas Fir. It is dimensionally stable and universally recognized for its superior strength-to-weight ratio. Its high specific gravity provides excellent nail and plate-holding ability. The species also enjoys a documented superior performance against strong forces resulting from natural phenomena such as winds, storms and earthquakes. It is truly the ideal structural and general purpose wood for framing lumber in residential, light commercial, multi story and industrial construction. The Douglas Fir/Western Larch species combination has the highest modulus of elasticity (E or MOE) of the North American softwood species. This is the ratio of the amount a piece of lumber will deflect in proportion to an applied load; it is a reflection of the species’ high degree of stiffness, an important consideration in the design of floors and other systems. In strength properties, Douglas Fir/Western Larch has the highest ratings of any western softwood for extreme fiber stress in bending (Fb); for tension parallel-to-grain (Ft); for horizontal sheer (Fv); for compression perpendicular-to-grain (Fc); and for compression parallel-to-grain (Fc//). These physical working properties, as well as to the moderate durability of its heartwood and its excellent dimensional stability, provide the reasons many builders use Douglas Fir as the standard against which all other framing lumber is judged. It is also tight knotted and close-grained, adding the bonus of beauty to its structural capabilities.Photo: above left: Weathered Fir Beam and Channel Siding. For timber frames and rafters Fir combines beauty and strength. The choice structural lumber. Red and amber tones for your interiors plus the organic patterns of grain will bring your walls to life. Turn these boards into anything you can think of, with a wide variety of grades to choose from. A classic western look, board and batt siding in Fir is economical and functional. 1 - #1 and Better - A great grade for applications where appearance and strength are both important. Timbers are also available with the following other options: FOHC (free of heart center), KD Kiln dried, R/C Rough cut, S4S surfaced 4 sides and Hand Hewn. Please call for pricing on these options. Tongue & Groove , Channel , Pattern 105, V2E , S4S, and many more standard patterns. Custom milling available. « Douglas Fir Soffits : Tongue and Groove V2E is one of the most common soffit options. Also available in Flush Joint, Edge plus center bead and custom patterns. « Douglas Fir Trim Craftsman, Shaker and many other architectural styles have Clear Vertical Grain and Clear Doug Fir trim as their first choice for tones and serviceability. The straight grained and exceptionally strong Douglas Fir tree is one of the most dominant species in the Northwest forests. After a forest fire, the tree springs to life, growing thickly in the sunshine of a newly open area. Over the past 100 years, it has been the favorite species of silviculturists because of its fast growth and multitude of uses. Its stiffness and durability make it ideal for structural applications. It also makes a good flooring and paneling product as well as a fine trim for doors and windows. Douglas Fir is known for its distinctive grain patterns, produced by the varying degrees of spring and summer wood in the grain. The color differences between the two range from yellowish to reddish brown. Douglas Fir flooring ages to a warm orange-brown color. Douglas Fir (Pseudotsuga menziesii) is not a true fir at all, it is a distinct species named after Archibald Menzies, a Scottish physician and naturalist who first discovered the tree on Vancouver Island in 1791, and David Douglas, the Scottish botanist who later identified the tree in the Pacific Northwest in 1826. Douglas Fir is North America’s most plentiful softwood species, accounting for one fifth of the continent’s total softwood reserves The wood of Douglas-fir varies widely in weight and strength. When lumber of high strength is needed for structural uses, selection can be improved by applying the density rule. This rule uses percentage of latewood and rate of growth as they affect density. For equivalent knot sizes, the higher density generally indicates stronger wood. Sapwood of Douglas-fir is narrow in old-growth trees but may be as much as 3 inches (7.62 cm) wide in second-growth trees of commercial size. Fairly young trees of moderate to rapid growth have reddish heartwood and are called red-fir. Very narrow-ringed wood of old trees may be yellowish brown and is known on the market as yellow-fir. The range of Douglas-fir extends from the Rocky Mountains to the Pacific coast and from Mexico to central British Columbia. The Douglas-fir production comes from the Coast States of Oregon, Washington, and California and from the Rocky Mountain States. Douglas-fir reaches heights of 250 feet (76.20 m), with a diameter of 6 feet (1.83 m), in coastal stands that are between 200 and 800 years old. The largest intact specimen was recorded at 330 feet (100.58 m) near Littlerock Washington. Bear Creek Lumber has access to an actively managed timber stand. The project is a sustained growth patch of mixed age Douglas Fir and Ponderosa Pine. The stand has been logged twice since 1910 and is presently being thinned. A mixture of middle-aged and old-growth products are being selectively harvested to improve the stand's health. These round wood products can be cut to order for log rafters, poles, posts, vigas and stringers. 6 to 12 inch and large diameters are available. They can be cut to any length. Customers interested in seeing the ecosystem management of a Northwestern forest are welcome to take a tour of the property. 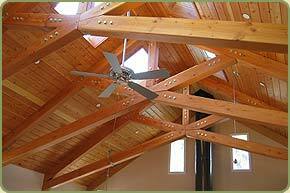 Above: Douglas Fir beams make up this scissor truss ceiling. Note also the ceiling paneling matching the beams. Durability: Rated as moderately resistant to decay. Douglas Fir is one of the few species available in large sizes from managed timberlands. It is preferred for heavy timber framing and large members are available in a variety of grades manufactured for construction uses where large material is needed to meet the engineering requirements of the design. Douglas Fir timbers are best known for their tough fiber, dense grain structure and strength. They are additionally valuable for their rustic beauty and excellent “Heavy Timber” fire ratings in the model building codes. Timbers can be shipped unseasoned or dry. May be specified rough cut, surfaced four sides (S4S) or resawn hewn. Bear Creek Lumber offersany option you could want.